I was, you can probably imagine, pretty gobsmacked when I came across it, rummaging through a box of paperbacks at the Fair, and even more gobsmacked when I saw that price. And it wasn't as if that particular dealer was an amateur: he had plenty of other paperbacks on display behind his table, bagged and no doubt appropriately – or even inappropriately – priced. The only thing I can figure is, he was one of the few remaining dealers who didn't know who Stark was. Maybe cult crime fiction wasn't his area of expertise. Now, having done all that deeply unattractive crowing, let me point out that this copy isn't, in fact, the 1962 first printing. 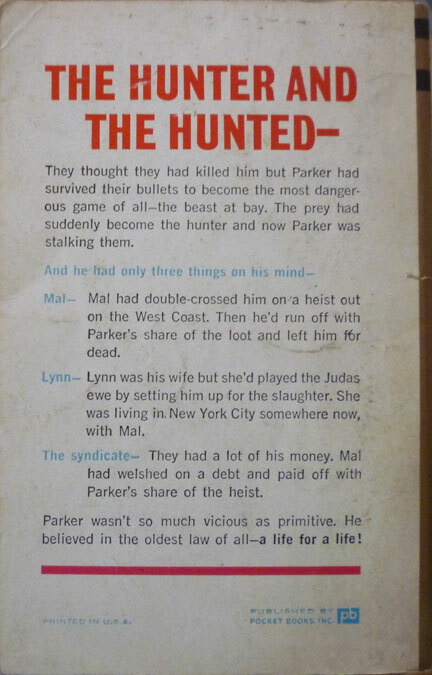 It's the 1963 Permabook edition, which, according to the copyright page, was printed from new plates (I think my Pocket Books copy of The Man with the Getaway Face is also a Perma). But to collectors that doesn't seem to matter; the '63 Perma edition is the most expensive one listed on AbeBooks, and the remainder of the maybe dozen copies listed are a mix of '63 and '62 printings. In any case, I care not a jot: it's an original, and it's mine. UPDATE: I've since learned that my copy is the first printing; the copyright line in the Pocket edition of The Hunter states it was printed December 1962, but published February 1963, hence the confusion. 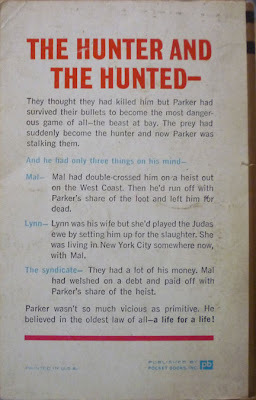 The cover artist for this first Parker novel – and the seven to follow – was the brilliant Harry Bennett, who I wrote about at length in this post. The little blue sticker you can see top right corner, with the "2/6" price on it (which is pre-decimalization British money), is presumably a holdover from when the book was originally imported into the UK. I don't know who "TP" were, but it looks as if they imported a rather random selection of books in the '60s: I found a listing online for a 1960 US edition of Francis Cargo's Frenzy (originally published as Jesus la Caille in 1914), which has a similar price sticker on the front; that novel is about a gay pimp in the Paris underworld. Of course, what used to happen in the 1960s (and earlier) was American paperbacks were unselectively shipped to Britain on boats in bulk, often merely to act as ballast, so it would always be a somewhat disparate selection. 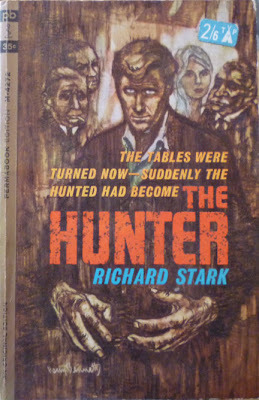 Funny to think of this copy of The Hunter, floating across the Atlantic decades ago, only to eventually wind up in my sweaty paws. I wonder where it's been hiding all this time...? Nice score! I'd love to go to that paperback fair one year. Ack! I thought I had a first edition, but upon closer inspection, I've got the same one you've got. Well like I say, that doesn't seem to matter to collectors. And there's all sorts of confusion on AbeBooks over first editions, second printings and whatnot. I'm not even sure I'm right in the assertions I've made. 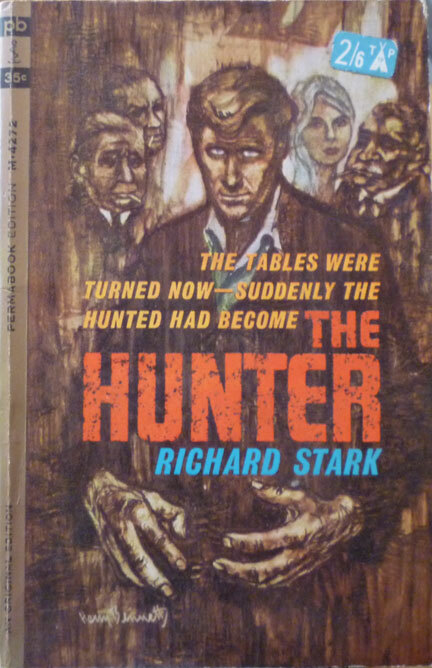 But the Pocket edition of The Seventh I've got simply states "First printing March 1966", with no mention of a later edition, so I guess that means The Hunter is a second printing. Same with my Getaway Face. Could be wrong though. Pocket might've changed the way they stated their copyright info by the time The Seventh rolled around. And that fair's only on once a year, Olman, so you got nearly 12 months to plan a trip! Surely there must be similar things in the States though? Re: "...I don't know who "TP" were..." They were Thorpe & Porter, a British firm who both imported and reprinted vast quantities of American popular fiction (paperbacks, comics, etc). An internet search on their name should keep you reading for hours. Aha! Thank you for that, David. And you're quite right: there's an abundance of information on Thorpe & Porter on the internet.